Without question, the most beautiful modernist Coffee/Spice Grinder that was ever created. 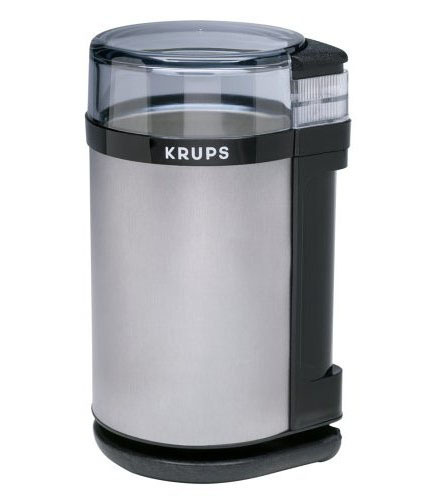 The industrial looking Coffee/Spice Grinder was designed by Krups in Germany and has become one of the best-selling grinders on the market. Integrated in the GX4100 discreet lines are elegant solutions which make it the best grinder on the market. The GX4100 features a 3-oz. bean capacity and grinds coffee beans from coarse to fine in seconds. The pulse action button lets you determine the degree of fineness. It can also be used to mince fresh herbs and dried spices. The sharp stainless steel blades quickly chop for easy preparation of your favorite dishes. Features a Brushed stainless steel finish and safety lock lid. Manufactured with a superior grade brushed stainless steel exterior. Krups stands professional-grade appliances. So they only use materials that are quite solid, to convey sturdiness, durability, value, and performance. • Minces fresh herbs and dried spices. * Grinds coffee beans from coarse to fine in seconds. • Superior Blade Milling System. • 3 oz. container capacity. * Superior 140 Watt motor.